The Royal Mint first introduced the fifty pence Beatrix Potter coin collection in 2016 in commemoration her 150th birthday, Peter Rabbit coins have become the most popular of the character coins in this series. The Royal Mail has gone on to release a new Peter Rabbit coin every year since and this year sees the fourth coin in this massively popular collectors’ series. This Gold Proof fifty pence coin is one of the The Royal Mints most stunning presentations of a character coin. With a limited presentation of only 500 coins, and struck to Proof Standard in 916.7 red gold, this is a coin to be treasured and to take pride of place in any collection. 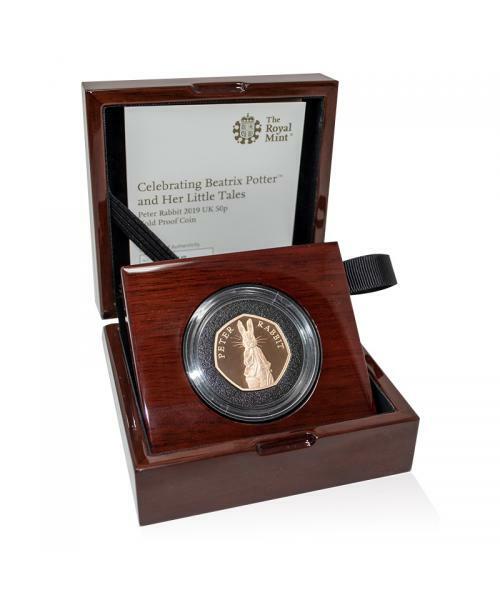 This magnificent collectable fifty pence Gold Proof coin wouldn’t have been possible without the genius that is Helen Beatrix Potter (1866-1943), an English write, illustration, natural scientist and conservationist whose characters have been capturing hearts for decades. She was best known for her collection of 23 children’s books featuring now iconic characters including Peter Rabbit, Squirrel Nutkin, Jemima Puddle Duck and Mrs Tiggy-Winkle. Childhood holidays in Scotland and the Lake District amongst the landscape, fauna and flora and numerous pets inspired the stories the children adore – the first of which was the self-published The Tales of Peter Rabbit. Beatrix Potter’s books continue to be popular throughout the world and have been published in many languages. Her life has been the focus of many films and television series, and her stories continue to be retold through film, song, animation and ballet. Beatrix Potter’s stories are beloved amongst generations and have stood the test of time and the annual release of the Peter Rabbit 50p coin now create much excitement and anticipated amongst casual admirers and professional collectors alike. This limited-edition Gold Proof coin is going to be a highly sought-after collectable of the future – with only 500 minted, adding this to your collection will give you the jewel in the crown of modern-day collectable coins from The Royal Mint. 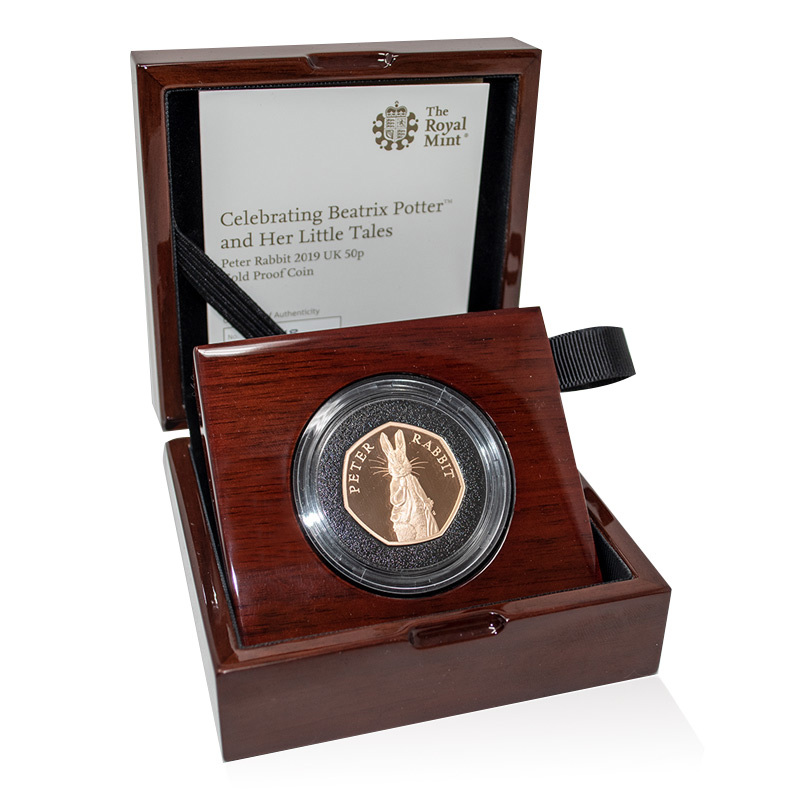 Our range of character coins at Exclusive Coins includes issues from the Beatrix Potter 50p collection. 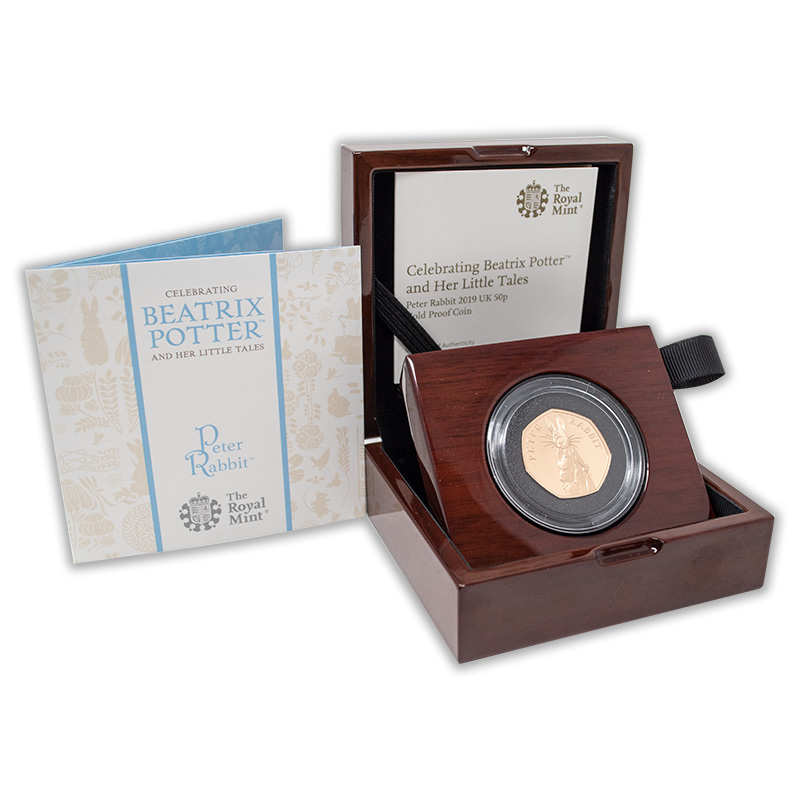 We also stock a wide range of Gold coins for your collection. If you would like help finding a coin, please contact us and we will be happy to assist you.